EB Industries is often asked how we join dissimilar metals together with precision welding. The most commonly requested combination is copper to stainless steel since both metals have unique material qualities which make them very different, yet great when combined. Copper has very high thermal and electrical conductivity, but it is fairly soft and malleable. Stainless steel has good hardness and high tensile strength, but it is not a great conductor. Also stainless steel is usually a less expensive material than copper. With the right experience and technology, these two unique metals can be cost effectively welded together for a high strength leak tight joint. The photo attached to this article shows a weld section of a 0.020” thick 316L stainless steel tube electron beam welded to an OFC copper plug. As can be seen, amazing results can be obtained with the proper design and the right welding technology. When designing the weld joint, the alloys of the stainless steel and copper should be considered first. The most common stainless alloys used in this type of application include 304, 304L, and 316L. 316 is not a recommended material as its higher carbon content makes it difficult to weld in general, let alone in a dissimilar metal joint. Preferred alloys of copper include the class of the oxygen-free copper (OFC) and oxygen-free high thermal conductivity (OFHC) alloys. These alloys typically have 99.95% or better copper purity with very low levels of oxygen and other chemical elements. The alloys listed in this article are by no means the only alloys that can be joined. 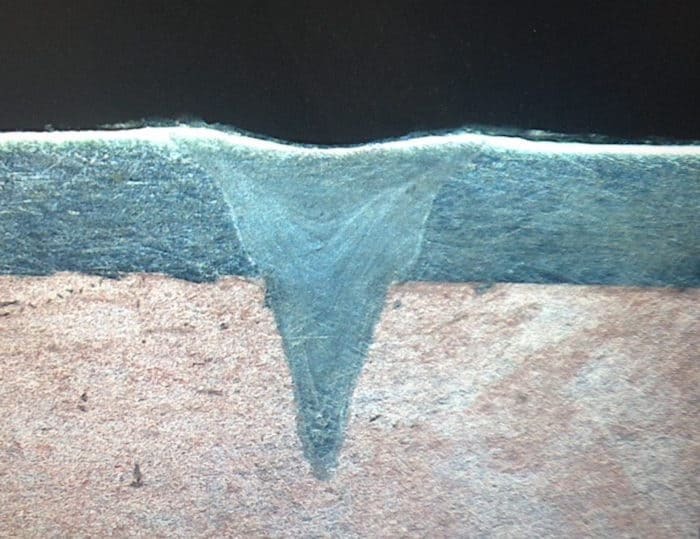 However, as different elements are added to the weld pool, the metallurgy of the joint can change drastically making the welding more challenging. For example, brass, which is made up of a combination copper and zinc, has significant challenges welding as the zinc boils out of the weld pool leaving voids and stress cracks. Sometimes these problems can be overcome by applying different welding technology, thermal treatment before and after welding, and the use of filler material. For any dissimilar material joint, thorough weld development and testing by a qualified and experienced precision welder or welding job shop, such as EB Industries, is highly recommended. An important aspect of welding stainless steel to copper is the physical design of the joint. Problems occur if the joint is designed where the weld energy comes through the copper first. Copper, being a great conductor of heat, tends to require a significant amount of welding energy before it melts. The high amount of energy causes two problems. First, the extra energy causes a larger than necessary heat affected zone and thermal distortions. Second, as the energy comes through the copper into the stainless steel, its high energy basically disintegrates the stainless steel causing holes and blow outs. A much better design would be to have the weld energy come through the stainless first and then into the copper. The advantage of this design is the right amount of heat can be applied to fuse the stainless to the copper. Any extra energy is quickly dissipated into the copper, much like a heat sink. The design gives a much more forgiving weld, and ultimately uses much less energy to fuse the parts. Electron beam welding is the preferred welding process for welding copper to stainless steel. The main reason for this involves the fact that EBW is a great process for welding copper in general, which is the more challenging of the two metals to weld. The electron beam has a very high energy density, which is not significantly impacted by the thermal conductivity of the copper, nor copper’s high reflectivity. The energy of the electrons quickly penetrates the surface of the copper resulting in a very narrow and deep weld pool. This pool can then be easily controlled to the required penetration depth. Laser beam welding is generally thought to not be a good welding process for joining copper to stainless steel. However, lasers have advanced in the last few years to the point where good results are regularly obtained. The primary limitation with laser beam welding stems from the fact that copper is highly reflective to laser beam light. For a CO2 laser, almost 99 percent of the incident light energy is reflected away. Lasers with shorter wavelengths such as Nd:YAG perform much better. Additionally, there are tricks that can be done with pulsing the laser break the surface reflectivity. Overall, electron beam welding welds copper to stainless steel better than laser beam welding. However, in applications with smaller joints and less weld penetration required, laser beam welding can provide excellent results. At EB Industries, joining materials like copper and stainless steel is something we do just about everyday. Our engineers are available to discuss your application and develop a fast, cost effective solution for you. Call us at 1 (631) 293-8565 or click below to submit an RFQ.